Karnataka Assembly floor test LIVE updates: Congress MLAs Anand Singh and Pratap Gowda Patil have been allegedly kept captive in Gold Finch Hotel in Bengaluru, News18 reported. Additional Commissioner Seemanth Kumar Singh along with his team are leaving for the hotel, the report said. Congress leader Veerapa Moily said that BJP will be "exposed" to the whole world. "They (BJP) know very well that they are 104. Still they are trying everything and anything to buy our MLAs. But, our MLAs are intact. The Supreme Court turned down Congress and JD(S)' plea against the appointment of KG Bopaiah as the pro tem Speaker KG Bopaiah. However, it allowed the live telecast of the trust vote. Ahead of the trust vote, JD(S) leader HD Kumaraswamy said that it wasn't an important d ay for him. "The important days will come in future. Till 4 pm, BJP will try to poach our MLAs. All the MLAs are together; no one is going to go to the other side," he said. Ramalinga Reddy claimed that Congress MLA will defy the party whip during the trust vote on Saturday. "Physically he is not with us, but he is in contact with our leaders... He will definitely vote for us" he said. 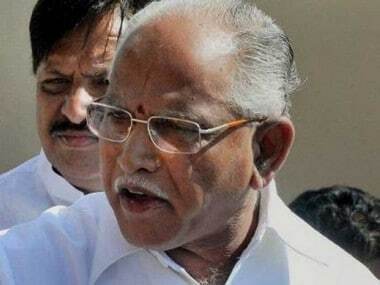 Chief Minister BS Yeddyrappa, who will be facing the floor test on Saturday, has reached Shangri-La Hotel for the BJP legislature meeting. Appearing confident, BS Yeddyurappa urged his supporters to stay calm and said that they would be celebrating at 5 pm. Buses carrying Congress MLAs reached Hilton Hotel in Bengaluru ahead of their oath-taking ceremony and the floor test in Karnataka Assembly. The Supreme Court directive on Friday to hold a floor test in the Karnataka Assembly on Saturday led to heightened political activity in the state, with the Cong ress-JD(S) post-poll alliance sure of Chief Minister BS Yeddyurappa losing the battle and the BJP sounding confident to sail through. The Supreme Court had in its Thursday morning order rejected Yeddyurappa's plea, made through senior counsel Mukul Rohatgi, asking for at least a week's time to face the floor test, and directed it to be conducted on Saturday instead. A bench of Justice AK Sikri, Justice SA Bobde and Justice Ashok Bhushan on Friday said the pro tem Speaker, conventionally the senior-most member of the Assembly, would administer the newly-elected members their oath and then conduct the floor test. The court junked Attorney General KK Venugopal's suggestion that the floor test be conducted through secret ballot. The court also barred Yeddyurappa from taking any policy decisions till the floor test. On Friday evening, the confrontation between the two sides once again reached the Supreme Court, with the Congress claiming that the appointment of BJP legislator KG Bopaiah as pro tem Speaker by the Governor "violates every single constitutional norm" of senior-most member being appointed to the post. Yeddyurappa was on Thursday morning sworn-in as the chief minister after the 12 May election threw up a hung Assembly. The BJP won 104 of the 222 seats, falling eight short of the 112-halfway mark. The Congress bagged 78 seats and the JD(S) 37. The court also restrained the chief minister from nominating an Anglo-Indian member. Following the apex court order, Yeddyurappa told reporters in Bengaluru that he was confident of proving his majority in the House. "We welcome the Supreme Court order of floor test at 4 pm on Saturday. We are confident of proving our majo rity," he said. Union Human Resource Development Minister Prakash Javadekar, who was election in-charge of the BJP in Karnataka, also expressed similar confidence. On the other hand, Congress president Rahul Gandhi said the BJP's "bluff" has been called. "The BJP's bluff that it will form the government, even without the numbers, has been called by the court. Stopped legally, they will now try money and muscle, to steal the mandate," he tweeted. Congress communications in-charge Randeep Singh Surjewala told reporters in Delhi that they will bring the matter of Bopaiah's appointment before the court. He said Congress member RV Deshpande was the senior-most member of the House. Bopaiah, 62, is a three-time legislator. He was speaker during the BJP rule in the state from 2008-13. Surjewala said Bopaiah has been indicted by the apex court. "People of Karnataka are determined to foil and defeat these evil and nefarious de signs of Governor Vajubhai Vala, Narendra Modi and Amit Shah," he said. Party spokesperson Abhishek Manu Singhvi said the BJP will be defeated in floor test and that Yeddyurappa had exhibited "desperation" in becoming the chief minister. Singhvi referred to Venugopal's suggestion and took a dig at the Modi government, saying that trust vote is never conducted through secret ballot. However, BJP spokesperson Sambit Patra accused the Congress of "murdering the mandate" in Karnataka after being "rejected" by the people of state with its numbers coming down from 122 to 78. "The Congress has welcomed the Supreme Court's decision. Some days back they had questioned the Supreme Court verdict in the case of judge Loya's death. They even tried to impeach the CJI," he said. Patra said both "prayers" of the Congress to the apex court to quash Governor's decision to invite the BJP to form government and to invite the Congress-JD-S instead have been rejected. "Yet the Congress is claiming victory, like Rahul Gandhi had claimed 'moral victory' after defeat in Gujarat elections," he said. Meanwhile, both Congress and JD(S) leaders said they had shifted legislators to Hyderabad to prevent the BJP from "poaching" them. In Bengaluru, Congress leader Ghulam Nabi Azad said it is surprising that the Congress and the JD(S), which together have the support of 117 legislators including two Independents, were not invited to form a government by the governor. Siddaramaiah held a crucial meeting with newly-elected Congress MLAs in Hyderabad to discuss the strategy to be adopted during the floor test.